San Gimignano, not necessarily a tourist trap! Scott on the tallest tower in town. This photo stretches across 25 years. 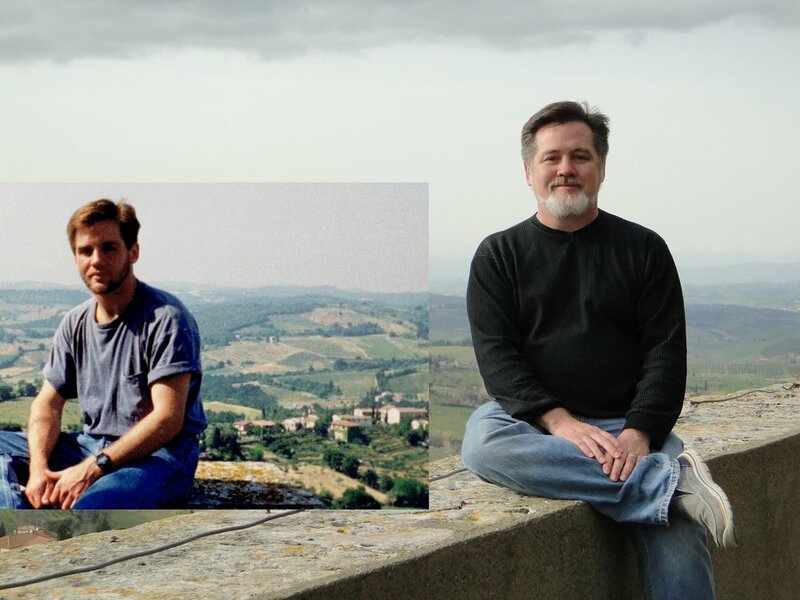 He may have changed a little, but luckily San Gimignano stays the same. We walked to a nearby agriturismo. The Vernaccia (local San Gimignano white wine) was fantastic, as were the biscotti and dessert wine. In 1991, I decided to go on a "once in a lifetime" trip to Europe to celebrate my graduation from college. I was immediately hooked on travel and overwhelmed with wanderlust. During my 1991 trip, one of the most memorable places was San Gimignano, a medieval walled hill town studded with towers. Some believe it to be too touristy and I'm sure it's crowded in high season, but I still love it! Janet and I had a fantastic time retracing my 25 year old steps and taking some new steps of our own. What occurred to me on that first trip was how much I didn't know about history. To visit these places so steeped in antiquity was enriching and ignited my inquisitive nature. Walking around San Gimignano alone at night in a foggy light rain was like stepping back in time. It was magical. That "once in a lifetime" trip to Europe instilled in me a lifelong passion for learning. 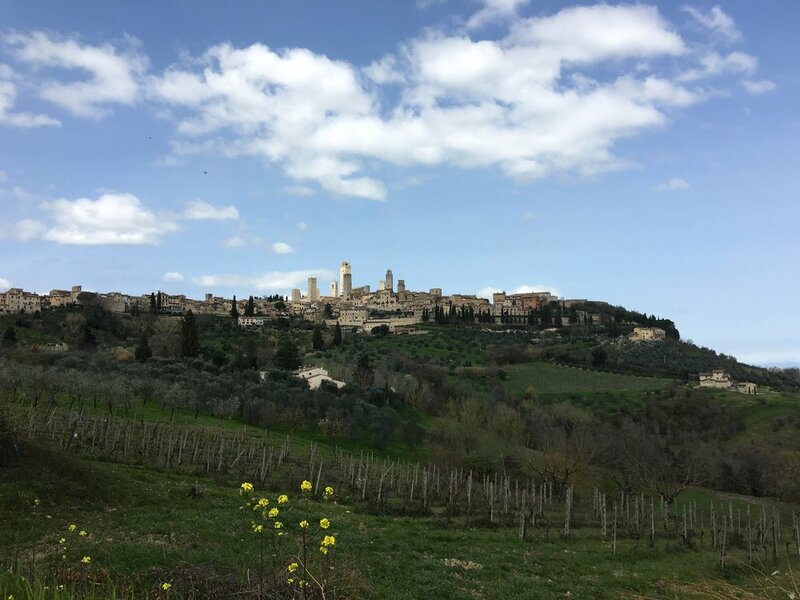 HINT: The trick to visiting San Gimignano is to escape the day trippers. Get outside the town in the afternoon, while leaving the early morning and evening to bask in the glow of this mystical place. Cats clearly own the world. It's nice that they let us share it with them. This winery gets an A+ for food safety! We found a winery and agriturismo within walking distance from town. An agriturismo is an agricultural operation that includes lodging and tours. It's an "Italian farm-stay." We toured the vineyards and olive groves learning about the process of growing grapes and olives, as well as wine and olive oil production. The facility was beautiful and we were served a wonderful lunch of ribollita (hearty Italian bean soup) and crusty bread. From our hotel balcony, we were treated to a steel drum concert along with the unbelievable scenery! What makes gelato so special? Our Rick Steves guide Lisa advised us that we should pass on any gelato that appears brightly colored and is mounded up high for display. You want the naturally colored gelato, and preferably, the one that's covered up with a lid. So, why is gelato special? It's intertwined with wonderful happy Italian vacation memories...and it's delicious!